2017 was called the year of the ICO, with the frenzied expansion that characterized it offering a wealth of new opportunities for crypto investing. Despite the fact that 2018 was bearish, and the market retracted, it still saw 2517 Initial Coin Offerings (3.5 times more than 2017’s total). 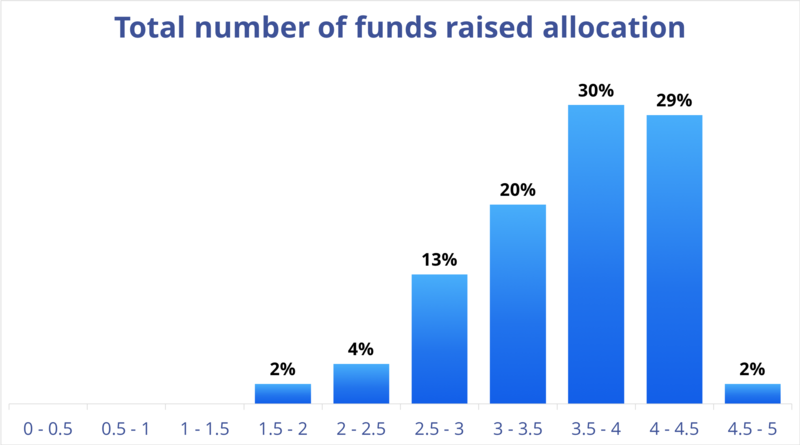 Around 40% of them achieved their funding goals successfully, while 60% failed to do so. After examining the historical data and the current state of the ICO market, ICObench is ready to present an in-depth analysis of the market since 2017. Companies launching ICOs are becoming more professional. 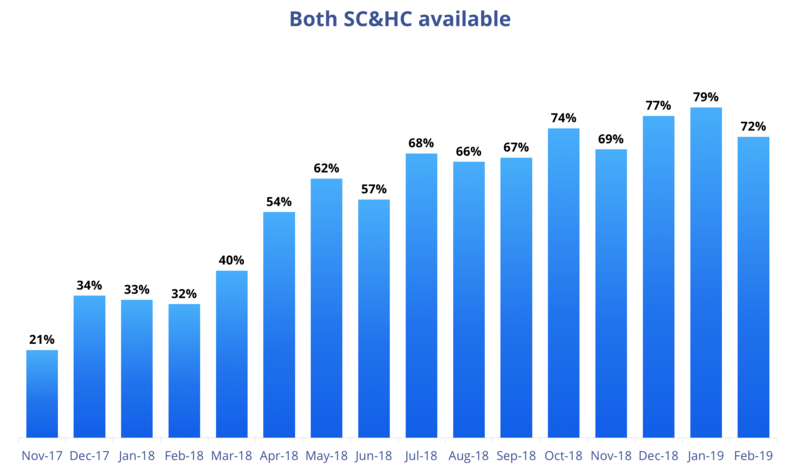 Starting from the second half of 2018 we see that over 70% of ICOs set both a soft cap and a hard cap; a year ago this figure was only around 30-40%. A possible explanation could be that companies participating in ICOs are becoming more and more transparent with their financial goals. 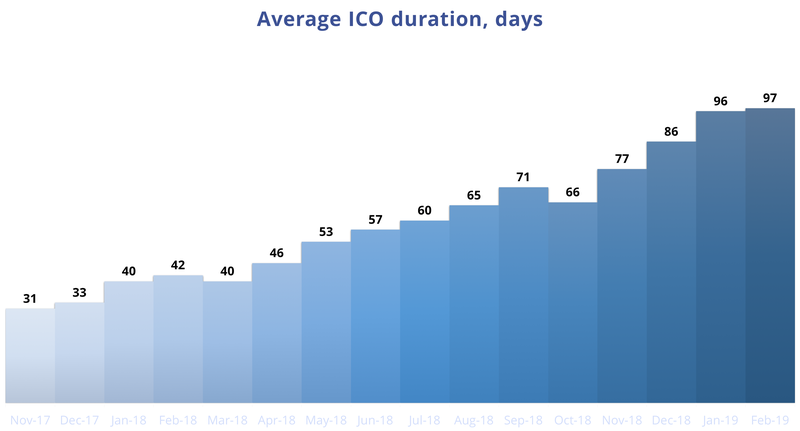 Average ICO duration has been increasing steadily, and almost achieved 100 days in February 2019. This mark has tripled since November 2017, when the average ICO duration was merely 1 month. This could indicate that now Initial Coin Offerings need more time to achieve their goals due to the general decline of the crypto market and less active investors. On the other hand, nuanced projects need more time to adequately share their ideas with the community, and investment now seems to be becoming more measured and less hasty. Moreover, a 3-month average lifespan requires steady funding, something that might be inaccessible to smaller, risky projects. Though the number of completed ICOs is falling (see the Stagnation section), the average success rate has significantly increased. A year ago only a quarter of all projects were successful, their number has been increasing since September 2018, and last month almost two thirds of ICOs reached their targets. It seems logical to conclude that this is occurring as a result of the industry maturation factor that has produced more experienced teams and more valuable expertise. 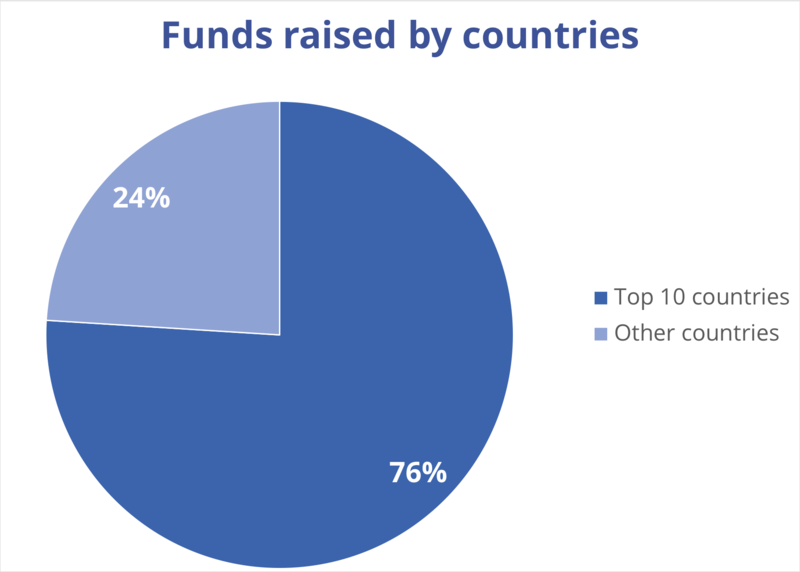 Funds raised by projects from the top-10 countries amount to 76% of the total funds raised. The USA is number one, both by the funds raised and the number of ICOs. 61% of the total funds were raised by projects with an ICObench rating of 3.5 and higher. 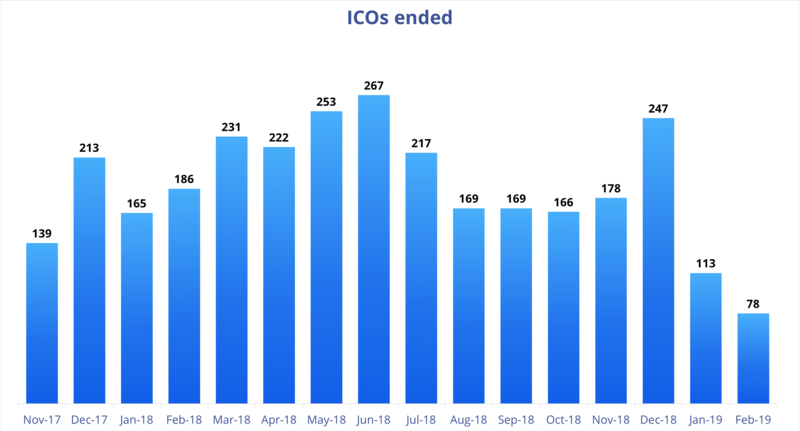 January 2019 saw a year-long minimum in terms of its number of completed ICOs, and February actually lowered that bar. Only 78 crypto and blockchain projects ended their Initial Coin Offerings last month, a number which is over three times less than the 2018 peaks of 267 in June and 247 in December. The general trend is clear: the ICO boom of the last year has been reshaped by a decrease in number of projects and an increase in quality (see Average Success Rate diagram above). It is no surprise that the total amount of funds raised also declined and reached its low at $0.2B in February. 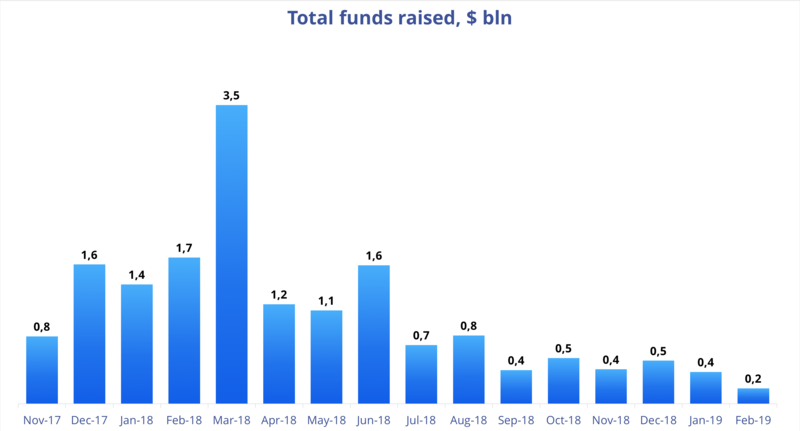 What is interesting is that this downturn didn’t start in 2019: despite a rather high number of completed ICOs in the second half of 2018, the total amount of funds raised was much lower than in the first half of the year. This may reflect the fact that already at that time people had become apprehensive of ICOs and were rather reluctant to invest their money in them, which was followed by lower quality projects leaving the ICO scene. The average funds raised by a project in February 2019 decreased to $7.8M which is 2 times less than the $15.3M of February 2018 and the $15.6M all-time average. STOs (Security Token Offerings) have rapidly been gaining popularity. Unlike ICOs, STOs offer tokens which are actual financial securities backed by assets or project profits. Security tokens are subject to federal laws, which makes STO investors feel more protected. According to Google Trends, the number of search queries for the term “STO” began to rise in September 2018 and reached its peak in November. 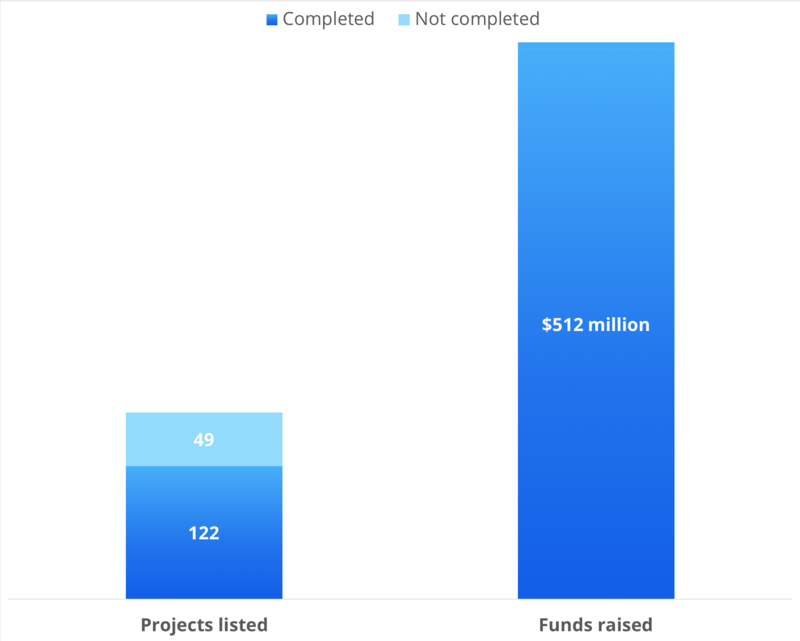 122 STOs have already been completed, raising $512M, almost equal to the amount raised by ICOs in January and February 2019. 49 Security Token Offerings are currently listed and ongoing Time will tell how this trend will affect the cryptocurrency market, and if 2019 becomes the year of STOs. Statistics show that the ICO market has been in stagnation for the last few months. However, there are still some positive trends which deserve attention. 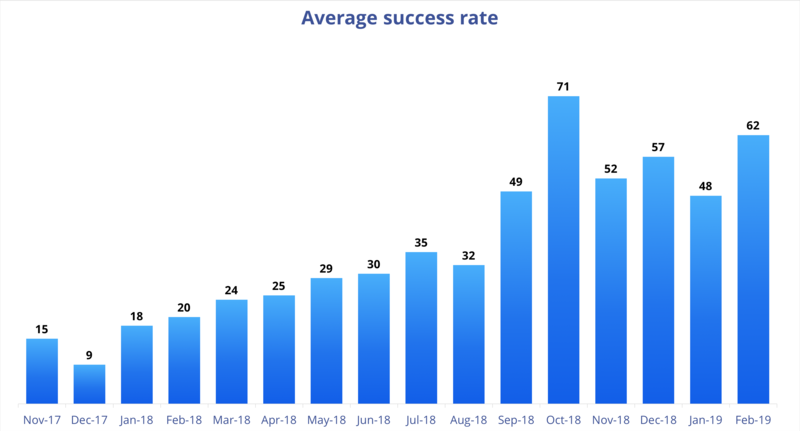 The average success rate has significantly improved since the beginning of 2018. The increased average ICO duration and the settings of both soft and hard caps indicate a more responsible approach in development. And the growing popularity of the STO may open new possibilities on the crypto market.